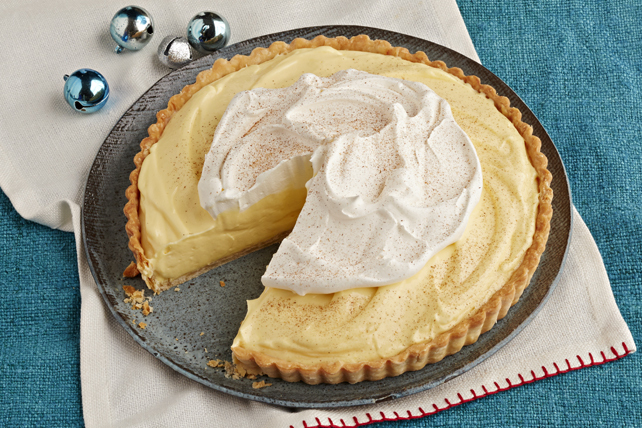 Our Creamy Eggnog Tart is sure to become a holiday favourite. This creamy tart is made with a homemade crust and an eggnog filling - perfect for your festive gatherings! Place Easy Homemade Pie Dough on lightly floured surface; roll out to 11-inch round. Use to line 9-inch tart pan with removable bottom; trim edge. Prick bottom of crust all over with fork. Bake 25 to 30 min. or until golden brown; cool completely. Remove rim. Beat pudding mix and eggnog in medium bowl with whisk 2 min. Stir in 1 cup Cool Whip; spoon into crust. Spread with remaining Cool Whip to within 2 inches of edge; sprinkle with cinnamon. Refrigerate 2 hours. For a sharper-edged crust, refrigerate pastry-lined tart pan 20 min. before baking as directed. The prepared tart can be refrigerated up to 24 hours before serving. Or for added convenience, the cooled baked pastry crust can be refrigerated up to 2 days before filling with the prepared eggnog filling and refrigerated as directed.